I accepted an invitation from Woodbridge Rugby Club to go to a pre-match lunch on Saturday. Not much unusual there except that it was for a women’s league game! Woodbridge had a break in their men’s league fixture list and rather than play at 2pm on a Sunday as usual, the club decided to showcase the women’s team on a Saturday afternoon. Woodbridge’s mens’ teams haven’t had the best of seasons, although the 2nd team finished runners-up in the Suffolk League, but the Womens’ side have remained unbeaten in South East One. The scheduled opposition for the day, Portsmouth Valkyries, called off earlier in the week, the bottom side fearing a heavy loss in Suffolk, but the walk-over meant that Woodbridge Amazons have won promotion to the next level. The Amazons were formed about five years ago when the ladies team at Ipswich decided to look for a new home as they were fed up with the lack of support they were receiving. Woodbridge welcomed them with open arms and although the core of the current team are from the original group new players have regularly joined. The Amazons have risen steadily through the leagues until the find themselves playing just two levels below the Premiership next season. Despite the success of England Women in getting to the final of the Womens Rugby World Cup last year, womens’ Rugby in Eastern Counties is struggling to establish itself. The top clubs are Woodbridge, Shelford and Lakenham-Hewett, with Southwold and Fakenham putting out sides regularly at lower levels. Other clubs have a few women and/or girls but rarely enough to play any meaningful games and there seems to be a reluctance to pool players so the womens game can grow. Colleagues in Eastern Counties are working very hard to overcome this but they will have their work cut out while clubs pursue their own parochial interests. Back to Woodbridge who must be applauded for raising the profile of the womens game. It is not a cheap enterprise as funds from the RFUW are pretty much non-existent. 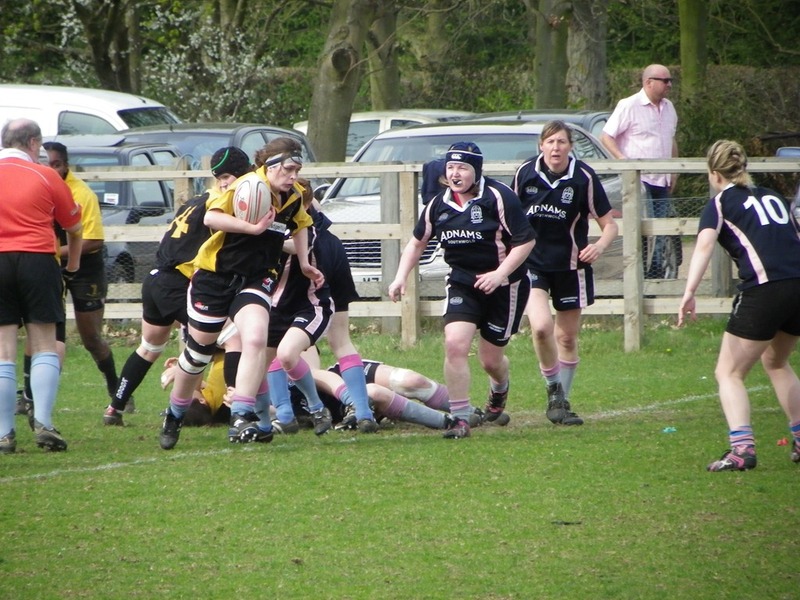 The travelling for womens teams is a big issue; the nearest opposition in the Amazons’ league is Romford with most of the rest of the league playing in West London, and unlike men’s rugby there is no help with travelling costs available. When the RFUW eventually merge with the RFU there will be some travel funding forthcoming but that looks to be a season or two away yet. The 75-strong lunch included guests from Diss Rugby Club who Woodbridge visited recently to get some tips and advice on fundraising for their changing room extension. Woodbridge has an ever-expanding youth and mini section and a couple of seasons ago bought some extra land to create a third pitch and more parking, but the current changing space is woefully inadequate. Plans for extra changing space are drawn up and the club is around £50k short of raising the £200k total needed. Diss came up with some innovative ideas to raise funds for their own extension which is in the process of being built and Woodbridge quite rightly have copied some of those ideas. As for the lunch itself, it was one of the best pre-match meals I’ve had at a local club, and that is no mean claim. The food was prepared free of charge by chefs from The British Larder, a restaurant just down the road from the Rugby Club, using top quality ingredients paid for by the club. A beautifully delicate seafood starter, Roast Gressingham Duck with kale mash and baked treacle tart to finish, all prepared to perfection. With Portsmouth calling off a Barbarian side made up with players from Southwold, Diss and Fakenham provided the opposition and didn’t read the script by scoring in the first five minutes! But as the game continued the Amazons got into the game and eventually won by about six tries to three. Overall it was a good day at Woodbridge, always a friendly club with the right attitude towards the game. They deserve every success. Thanks for taking the time to write this and attending our league lunch.